Disculpa, pero esta entrada está disponible sólo en Inglés Estadounidense y Francés. For the sake of viewer convenience, the content is shown below in this site default language. You may click one of the links to switch the site language to another available language. Galerie Xippas is pleased to present Bodies’ Delays, a collective exhibition by the artists Philippe Decrauzat and Pierre Paulin, with the participation of Dan Walsh. Bodies’ Delays is based on the film Morceaux choisis shot in 16 mm, co-directed by Philippe Decrauzat and Pierre Paulin. 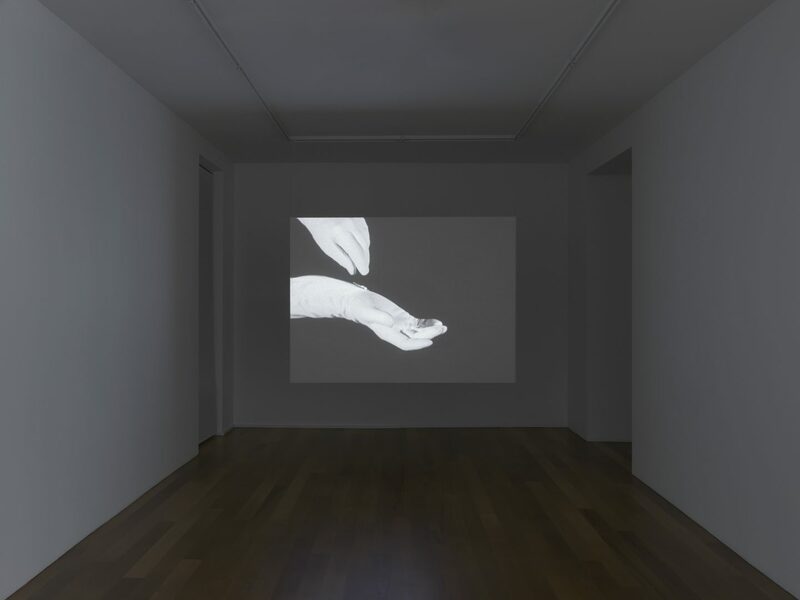 In each frame, a gloved hand manipulates one of the copies of the pieces of clothing in Pierre Paulin’s wardrobe, which are printed with poems and essays. Alternating between the texts and ordinary gestures – folding, turning over, zipping and unzipping – the film highlights the ambiguity of gestures which fall somewhere between the handling of clothing and the exhibition of work. The shapes canevas, Still (Time stands), presented by Philippe Decrauzat, also play on the theme of ambivalence. In his work, he uses film, painting, and the respective stories of both media. 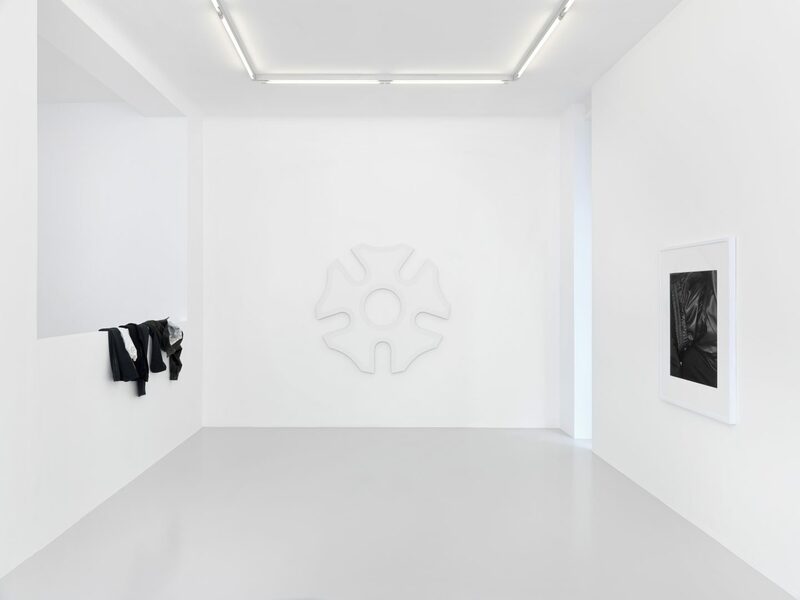 This new series of paintings is inspired by drawings of Maltese crosses – the mechanical pieces found in cameras and projectors. When they rotate, these technical elements wind up the reel whilst simultaneously producing stills in order to exhibit or project a series of fixed images in constant flux. The paintings build on the drawings of these mechanical pieces at rest, and tone-on-tone tracings can be seen on their surfaces. These slight remanences highlight the dislocations caused by the transition from the shape of the canvases to the variations of the paint. This dislocation is also visible in Pierre Paulin’s work, where his artistic and poetic practice blurs together with the practice of clothing looks. In his work, the term “look” refers to the assembly of “basics” – jeans, trench coats, t-shirts, hoodies, military boots – which are recombined to produce a clothing style. For him, clothes are like the words we use to write a poem: they are elements of a language developed from a shared cultural history which are wielded to create slight singularities. In this regard, Pierre Paulin’s works are variations on his writing and his wardrobe. 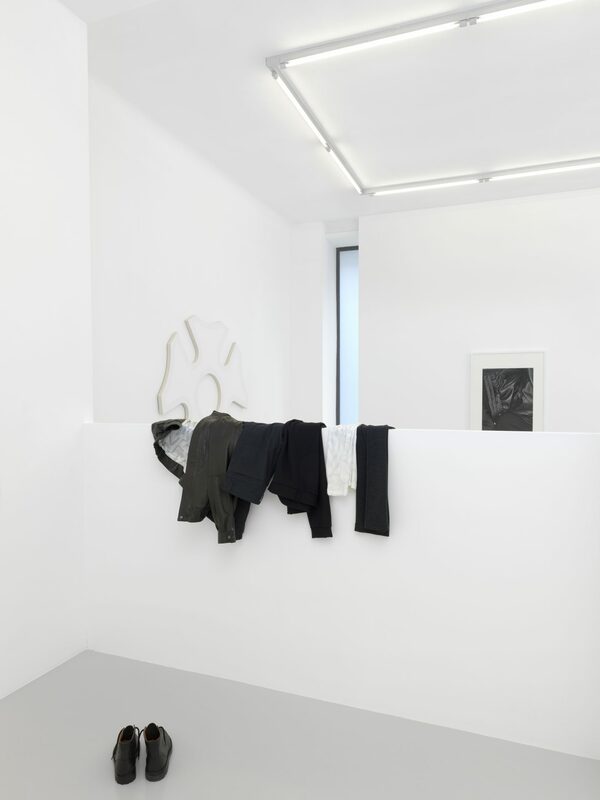 For this exhibition, he presents a set of copies of his clothing on which are published his essay Ils glissèrent dans l’obscurité, photographs of a contortionist wearing the same clothes, as well as a white leather book containing four texts on the subject of the “look”. 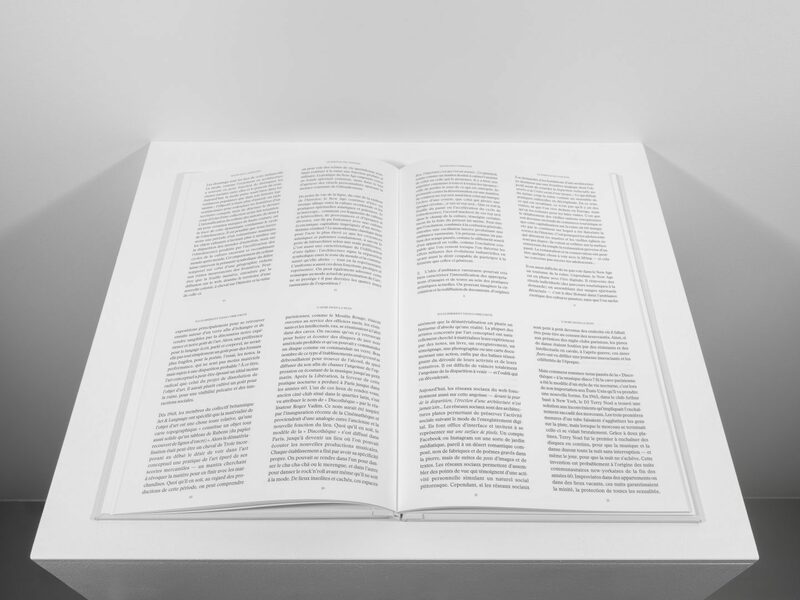 Dan Walsh’s contribution to the exhibition is in the form of a book. This recent edition, entitled Black and white, is made up of 44 pages of drawings painted in black and white, and presents a succession of semi-circles painted with a wide brush on paper. 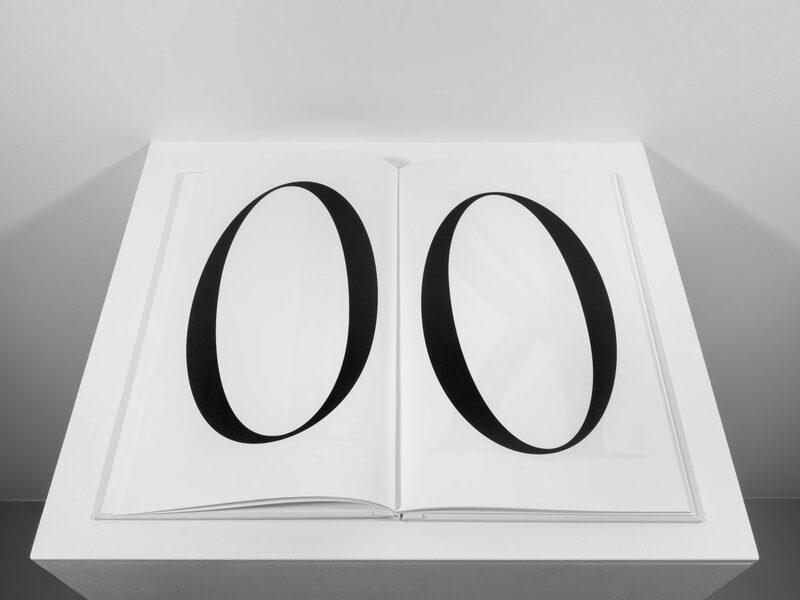 Each set of facing pages presents the same drawing, first in white on a black background, then in black on a white background. 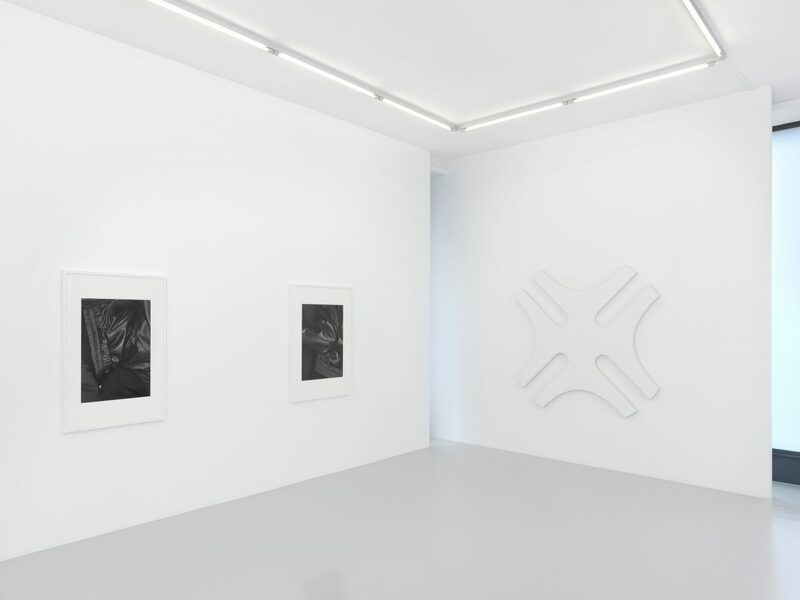 On first viewing, we would appear to be looking at positive and negative photographs of these drawings, but the infinitesimal differences between them invite the viewer to look again at the repetition of the same gesture. 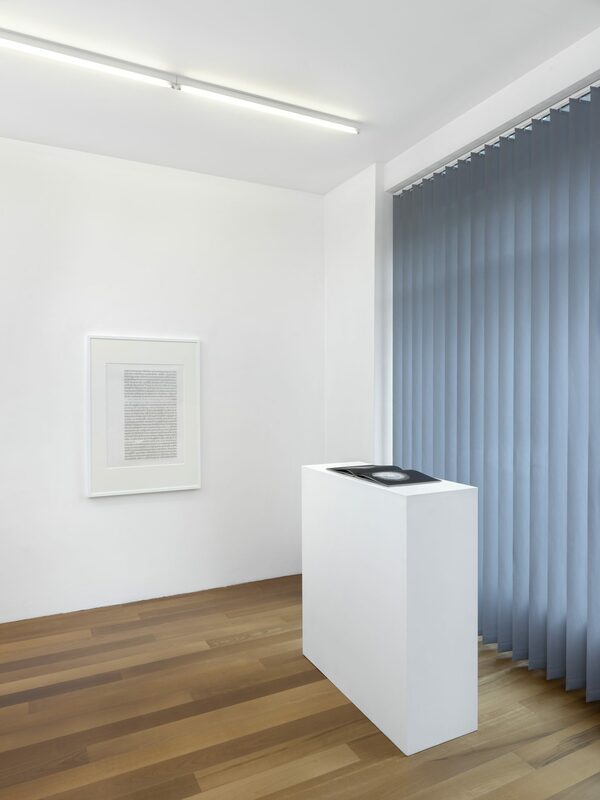 From books to painting, from poetry to film, from clothing to gesture, the exhibition Bodies’ Delays presents a corpus of delays, variations and repetitions, produced by the transition from one language to another, from one practice to the next. Philippe Decrauzat is a Swiss artist, born in 1974. He lives and works in Paris and Lausanne. Whether they are presented as paintings, murals, paper creations, shaped canvases, installations, films or sculptures, his works all have in common a complex geometric composition. 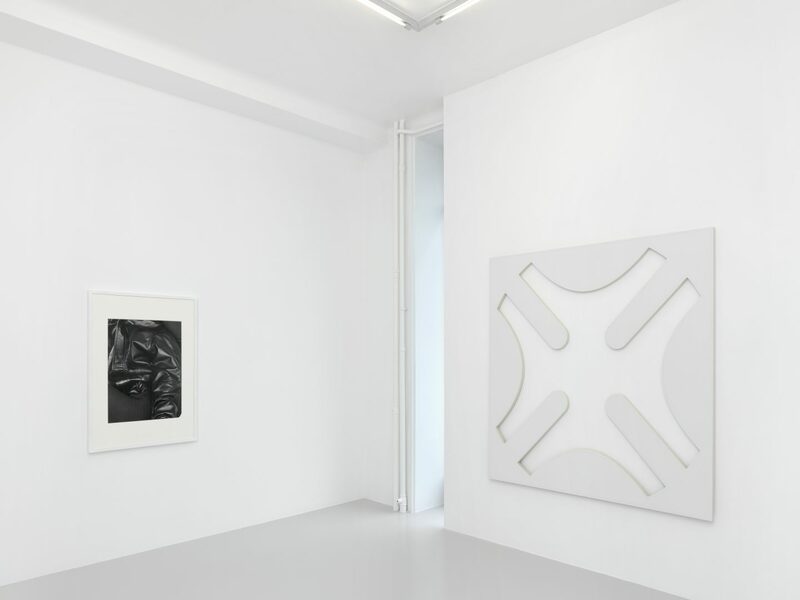 By exploring the status of abstraction in contemporary culture, and transcribing it plastically, he questions the viewer’s gaze and perception of both his works and his space. Philippe Decrauzat is the co-founder of the independent space CIRCUIT, and a professor at the Ecole Cantonale d’Art de Lausanne (ECAL). He was co-curator of the exhibition A Personal Sonic Geology with Mathieu Copeland at FRAC (regional collection of contemporary art) – Île de France in Paris in 2015. In recent years, he has had a number of solo exhibitions, including an exhibition at the Musée d’Art Moderne de la Ville de Paris (2016-2017); at Magasin in Grenoble in 2014; at the Plateau FRAC (regional collection of contemporary art) Ile-de-France in Paris in 2011; at Haus Konstruktiv in Zurich in 2009; at Secession in Vienna in 2008; at the Centre d’art contemporain in Geneva in 2006. He has also taken part in several group exhibitions, including Construire une collection, at the Musée des Beaux-Arts in Rennes, and La Triennale de l’art imprimé contemporain at the Musée des Beaux-Arts of Le Locle in 2018; at the MAMCO in Geneva in 2016; at the Centre d’art contemporain of Yverdon-les-Bains in 2014; at the Carré d’Art in Nîmes in 2013; and at the Palais de Tokyo in Paris in 2011. Pierre Paulin is a French artist, born in 1982. He lives and works in Paris. Combining poetry, essays, translations, publishing and ready-to-wear clothing, Pierre Paulin’s artistic work is part of today’s visual culture. 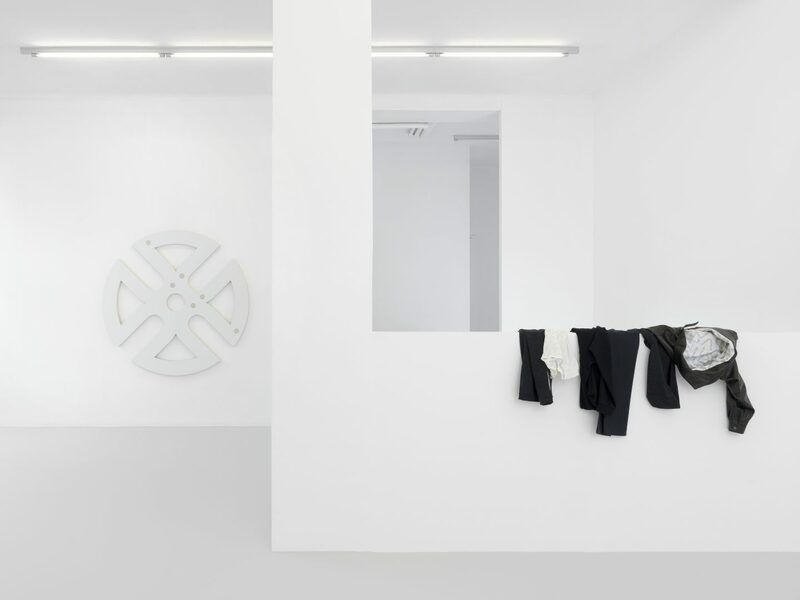 The use of the term «look», to describe both his poetic work and the clothing sets he produces, is the common denominator of a practice of writing and art based on the combination and translation of cultural signs and formats. From clothing to text, from body to words, Pierre Paulin makes no distinction between the written word and the representation or between the image and speech. The text is omnipresent, whether in his clothes (pockets and linings), his videos, his books and his editions. His work was exhibited at the Palais de Tokyo in Paris in 2013, the Centre de la photographie in Geneva in 2014, the Ricard foundation and the Calouste-Gulbenkian foundation in 2017. Also in 2017, he had a solo exhibition at the Plateau FRAC (regional collection of contemporary art) Ile-de-France in Paris. 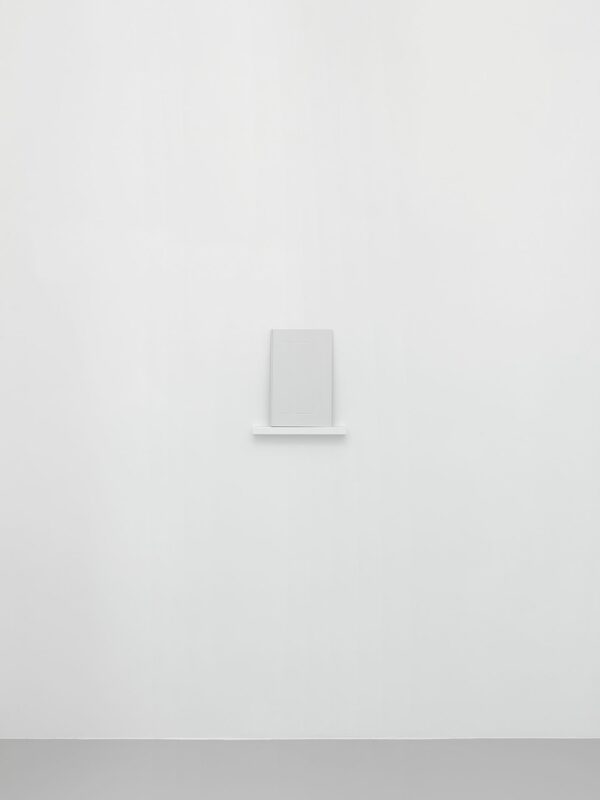 In 2018-2019, the contemporary art center CIRCUIT in Lausanne is devoting a solo exhibition to him, entitled «O o, u u». His works are presented in several public collections such as the CNAP, the Frac Basse-Normandie or the Plateau FRAC Ile-de-France.